Difference between revisions of "Leeuwarden (Friesland, Netherlands)"
Eekhoff, W. <em>Geschiedkundige beschrijving van Leeuwarden. </em>II, 111. Hoop Scheffer, Jacob Gijsbert de. <em>Inventaris der Archiefstukken berustende bij de Vereenigde Doopsgezinde Gemeente to Amsterdam</em>, 2 vols. Amsterdam: Uitgegeven en ten geschenke aangeboden door den Kerkeraad dier Gemeente, 1883-1884:I, Nos. 5, 237, 241 f., 356, 375, 493; II, Nos. 99, 2042-47; II, 2 No. 252. Hoop Scheffer, Jacob Gijsbert de. <em>Inventaris der Archiefstukken berustende bij de Vereenigde Doopsgezinde Gemeente to Amsterdam</em>, 2 vols. Amsterdam: Uitgegeven en ten geschenke aangeboden door den Kerkeraad dier Gemeente, 1883-1884: v. I, Nos. 5, 237, 241 f., 356, 375, 493; v. II, Nos. 99, 2042-47; v. II, 2 No. 252. <em>Naamlijst der tegenwoordig in dienst zijnde predikanten der Mennoniten in de vereenigde Nederlanden. </em><em>Amsterdam</em>(1815): 97 f.
<em>Naamlijst der tegenwoordig in dienst zijnde predikanten der Mennoniten in de vereenigde Nederlanden. </em><em>Amsterdam</em> (1815): 97 f.
Leeuwarden (1953 population, 79,960; 1,898 Mennonites in 1947; 2007 population, 92,203; coordinates: 53° 12′ 0″ N, 5° 47′ 24″ E), capital of the Dutch province of Friesland, was the seat of a large Mennonite congregation (1,020 baptized members in 1956), which was the oldest congregation of Friesland and one of the oldest in the Netherlands. This congregation can be traced back to Melchior Hoffman who preached here in 1532 among a group of adherents, among whom was Obbe Philips; Hoffman's followers mostly belonged to the middle classes. Undoubtedly the Anabaptist group at first led a hidden existence. In the fall of 1533 two apostles of Jan Matthijsz van Haarlem, viz., Bartel Boeckbinder (Bartholomeus van Halle) and Dirck Cuper (Kuiper), visited the group and baptized Obbe Philips and Hans Scheerder, 14 or 15 persons being present. The next day both Obbe and Hans were ordained as elders. In the following years there were at Leeuwarden only slight traces of Münsterism. Menno Simons often visited the congregation, the last time in 1557. Elder Leenaert Bouwens baptized here as follows: 1551-1554, 26 persons; 1554-1556, 34; 1563-1565, 198; 1568-1582, 247; a total of 505. Both the first and the last Anabaptist martyr put to death in the Netherlands were executed at Leeuwarden. The first was Sicke Freerks Snyder on 20 March 1531, the last Reytse Aysesz on 23 April 1574. The martyr Elisabeth Dirks, who was executed on 27 May 1549, was a member of the Leeuwarden congregation and is said "to have seduced many persons." 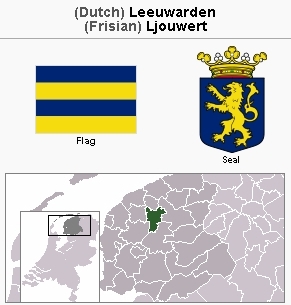 The congregation of Leeuwarden played a part in the Frisian-Flemish schism in 1566-1567. About 1560 the elders, preachers, and deacons of four congregations (Leeuwarden, Dokkum, Franeker, and Harlingen), without the knowledge of the members, made a secret agreement of 19 articles (Verbond der Vier Steden, see Doopsgezinde Bijdragen 1893), which was one of the causes of the Frisian-Flemish quarrel. A Flemish congregation meeting near the "Waag" (municipal weigh-house). Of this congregation there is not much information; it is said to have numbered about 200 members in 1695, being at that time the largest Mennonite group in the city. On 21 June 1705 it merged with the Waterlander congregation. An Old Frisian (Janjacobsz group) congregation (in [[Naamlijst der tegenwoordig in dienst zijnde predikanten der Mennoniten in de Vereenigde Nederlanden|Naamlijst]] erroneously called Old Flemish), meeting at the "Zwitsers waltje"; it was founded about 1600, and greatly prospered in the early 17th century. (In 1603-1612 Elder Jacob Theunisz baptized 97 persons here.) In 1695 its membership numbered only 21, and in 1758 the few remaining members joined the United Waterlander-Flemish congregation. Their last preachers were Jan Gerbens until about 1740, Siebrand Douwes 1715-ca1750, Hendrik Benedictus ca. 1750, Meinert Daniels 1741-1758, who still served the United congregation after the merger until he resigned in 1769, and Pieter Cornelis van 't Veer 1752-1758. A Waterlander congregation, which met at the Wirdumerdijk, which had about 100 baptized members in 1695. The oldest meetinghouse has disappeared; a new frame meetinghouse was built in 1631; it was completely renovated in brick in 1760, rebuilt in 1760, and again rebuilt and enlarged in 1850 as may be seen by a commemorative stone tablet. Other renovations took place in 1889 and later. The old pulpit and organ of the Amsterdam Toren meetinghouse, which had been in the Amsterdam Zonist church, were bought by the Leeuwarden congregation and installed on 20 June 1813. There probably was also a Frisian congregation, although nothing is known about it. Of a High German congregation there is only one literary trace. It must have merged with the Waterlander congregation before 1647. A congregation of Pieter Jeltjes-volk is also mentioned here. The Mennonites of Leeuwarden had much trouble with the city magistrates until the 18th century. In 1596 the Reformed preacher Ruardus Acronius obtained permission from the magistrates to enter the meetings of the Mennonites "op het Niewland" (i.e., of the Waterlanders on the Wirdumerdijk) to interrupt the preacher. This led to the Leeuwarden disputation of 1596. Especially Johannes Bogerman, who was a Reformed minister at Leeuwarden (1604-1626) and professor at the Franeker University (1636-1637), opposed the Mennonites. He succeeded in setting the magistrates against the Mennonites. In 1631 Lamberts Jacobs, the Waterlander preacher, was fined twice because he had ventured to preach in the new church against the will of the government. Especially the Janjacobsz group occupied the attention of the authorities. They were exhorted by the magistrates in 1670 and 1675; perhaps their strict practices of banning and shunning gave the government a justifiable reason to take action. In 1687 Jacob Jansen Voogt, preacher of the Waterlander congregation, was banished because of Socinianism, but residing in the city was permitted and even preaching, on condition that he be examined beforehand by the Reformed ministers. There is also evidence that the city government was kindly disposed to the Mennonites. Marcelis Goverts, a Mennonite, was appointed city architect and when he and his wife, Mayke Marcus, founded a Hofje (home for old women) on 11 December 1658, which was presented to the deacons of the Waterlander congregation on 16 August 1659, the Court of Friesland gave its approval notwithstanding the fact that the Reformed Church of Leeuwarden contested the right of the Mennonites to administer the old people's home. Since 1758 there has been only one Mennonite congregation in Leeuwarden. In that year the baptized membership may have numbered about 370. In 1834 it had decreased to 270, but from then there has was considerable growth: 533 in 1861, 941 in 1898; 1,020 in 1956. In the 17th and 18th centuries Collegiantism had a rather strong influence on the Mennonite congregation. Arrien Jansen in 1682 disturbed the congregation by his ideas that baptism be administered only by immersion, and that the Lord's Supper should not be held in the morning, as was usual, but during the night. Those who favored baptism by immersion built a large stone tub in the floor of the meetinghouse, in which baptism was administered by immersion a few times. The appearance of the tub was a source of unrest in the congregation and a schism threatened. The provincial government of Friesland on 15 February 1720 ordered the tub removed. However, this did riot happen before 1850, although baptism by immersion had dropped out of use and peace had returned. But Arrien Jansen and his followers, who had separated from the main body in August 1720, were not reaccepted as members until January 1726. During the years following the French Revolution there was another conflict in the congregation. Its preacher Abraham Staal, who served beginning 1788 (before this time he had been a Lutheran minister), and who was a fanatical Patriot, was dismissed from his position in 1792 because the majority of the members did not share his views. On 14 July 1797, he was received again into the ministry on the order of the city government, but soon afterwards the congregation and Pastor Staal came to an agreement, the latter voluntarily resigning. Other ardent Patriots in this city were the Mennonites Oene K. Gorter and Dirk Zeper. For a long time the Leeuwarden congregation was served by lay ministers. Among them were Claes Karsten Tigler 1680-1725, his son Djurre Clases Tigler (years of service unknown), Here Fedes 1716-ca.1750, Dirk Uptes Oldersma 1726-ca. 1751, Uilke Wytzes de Vries 1726-1762, Heert Michiels 1726-ca.1780, and Claas Koopmans 1772-ca.1800. Usually there were four or five ministers. The first minister of the Leeuwarden congregation to be educated at the Amsterdam Mennonite Seminary was Klaas Tigler, a grandson of Claes Karsten Tigler and son of Djurre Clases Tigler. He served 1750-1785. In 1753 two other trained ministers were called; viz., Siebolt (van) Abbema 1753-1766, and Jacobus Hesseling 1753-1791. They were followed by Jan Menalda 1764-1771 and Pieter Brouwer 1785-1787. Until about 1800 there were in the congregation, besides the trained preachers, also two or three lay preachers chosen from the congregation. Jan Brouwer, called in 1793, was the only preacher from 1805 until he resigned in 1822. He was followed by Cornelis S. van Geuns 1822-1827, Jan Pol 1827-1849, Abraham Allard Hulshoff 1845-1870, Matthijs van Geuns Corrnszn 1849-1888, P .W. Feenstra 1870-1897, P. K. Bijl 1888-1892, P. Zondervan 1892-1924, M. L. Deenik 1897-1931, J. D. Dozy 1926-1933, J. IJntema 1931-1936, L. Bonga 1934-1952, F. van der Wissel 1937-1957, Th. Van Veen 1953- , J. T. Nielsen 1957- . The congregation has an old people's home, called the Marcelis Goverts-gasthuis, and in 1925 acquired a room for youth meetings and other church activities in the Ruiterskwartier. In 1952 the room for the church board, in which are found three beautiful paintings by the artist Lambert Jacobsz, who was preacher of the Leeuwarden congregation until 1636, and also the rooms for catechetical classes were rebuilt. Church activities in 1956 included a choir, women's circle, men's circle, young members' group of the 18-30 years, youth group, and Sunday school for children. In 1954 two stained glass windows by Joep Nicolas were installed in the church, representing the miraculous draught of fish (John 21) and the footwashing incident (John 13). Doopsgezinde Bijdragen (1861): 138; (1874): 59-76; (1893): 1 ff., passim; (1900): 90; (1917): 125; (1918): 110, note I.
Eekhoff, W. Geschiedkundige beschrijving van Leeuwarden. II, 111. Hoop Scheffer, Jacob Gijsbert de. Inventaris der Archiefstukken berustende bij de Vereenigde Doopsgezinde Gemeente to Amsterdam, 2 vols. Amsterdam: Uitgegeven en ten geschenke aangeboden door den Kerkeraad dier Gemeente, 1883-1884: v. I, Nos. 5, 237, 241 f., 356, 375, 493; v. II, Nos. 99, 2042-47; v. II, 2 No. 252. Naamlijst der tegenwoordig in dienst zijnde predikanten der Mennoniten in de vereenigde Nederlanden. Amsterdam (1815): 97 f.
Yntema, J. and Nanne van der Zijpp. "Leeuwarden (Friesland, Netherlands)." Global Anabaptist Mennonite Encyclopedia Online. 1957. Web. 25 Apr 2019. http://gameo.org/index.php?title=Leeuwarden_(Friesland,_Netherlands)&oldid=101079. Yntema, J. and Nanne van der Zijpp. (1957). Leeuwarden (Friesland, Netherlands). Global Anabaptist Mennonite Encyclopedia Online. Retrieved 25 April 2019, from http://gameo.org/index.php?title=Leeuwarden_(Friesland,_Netherlands)&oldid=101079. Adapted by permission of Herald Press, Harrisonburg, Virginia, from Mennonite Encyclopedia, Vol. 3, pp. 309-310. All rights reserved.